This budget friendly stainless steel bottle opener makes a great promotional item, event souvenir, or gift. One of those things that's just handy to have around, it can be personalized on one or both sides with the full color graphics of your choice. A great gift for your wedding party, or a promotional item for your business, this 6oz stainless steel flask is available in several colors and can be personalized with a recipient's name, an event or your company logo. Customize this 6 oz. 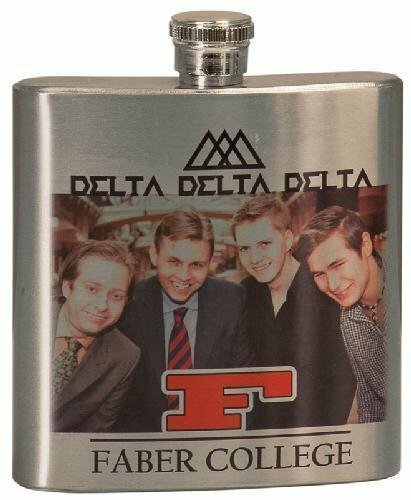 stainless steel flask with your own photo, logo or other graphics imprinted in full color for a unique way to promote or commemorate a special event, or a great personalized gift. This 6 oz. stainless steel flask set is available in a variety of finishes and is complete with a funnel for filling. Packaged in an attractive foam lined black gift box, the flask can be personalized for a great promotional item, incentive or personalized gift suitable for almost any occasion or event. This attractive stainless steel travel mug will keep your beverage hot or cold while the leatherette grip keeps your hands comfortable. The grip can be personalized to black for stunning contrast. The mugs include a screw on lid with a snap closure to prevent spills. A great price for any budget, this travel mug makes a unique incentive, promotional item or personalized gift, or a practical keepsake to commemorate a special event or occasion. This T-shirt magnet is made of gloss white aluminum and can be personalized in full color with a photo, your school or organization's logo, or even your jersey number for a useful promotional item, personalized gift, or souvenir. This wine bottle stopper is a perfect combination of style and function. It is a great housewarming gift, corporate gift, wedding gift, or great for all wine lovers. The food grade rubber seal keeps the wine fresh for as long as possible. 4" x 1 3/4" x 1"
This sturdy white aluminum luggage tag can be personalized in bold full color. With smooth rounded corners, and a slot to attach a strap, the tag has a UV resistant finish to help prevent fading. It makes a great promotional item or personalized gift.